Melasma is painless, benign skin condition and does not require any type of medical treatment. But since it most commonly occurs in highly visible areas such as the face, arms and neck, many men seek treatment to reduce the impact of melasma on their appearance. Melasma is a condition in which patches of the skin darken and appear brown or gray-brown. 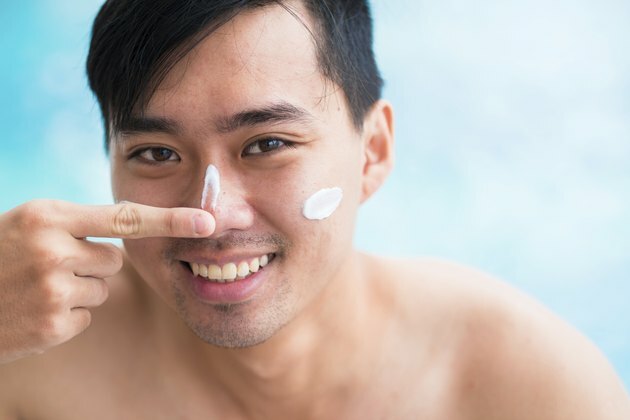 Only 10 percent of those diagnosed with melasma are men, and while its cause is not known, family history, dark skin and exposure to the sun increase your risk, according to the American Academy of Dermatology. The first step is to reduce your risk for developing melasma by applying sunscreen every day, all year long. The AAD recommends choosing a sunscreen that protects from both UVA and UVB rays and has a sun protection factor, or SPF, of 30 or more. You may also consider using zinc oxide and titanium oxide to block the sun when you're outdoors for longer periods of time. Melasma is treated by lightening the discoloration with bleaching agents. Creams containing an active ingredient called hydroquinone are available in most drug stores, but your physician can prescribe hydroquinone in a higher concentration that's more effective. Other prescription medications that may be used to treat melasma include tretinoin, corticosteroids and azelaic acid. If your melasma does not respond to topical creams, a superficial chemical peel or microdermabrasion may help by removing the upper layers of skin. Hydroquinone must be applied very carefully so that it does not come in contact with the surrounding skin because normal skin may also be bleached along with the darkened patch. The medication also should not be applied on irritated or injured skin. It's very important to protect your skin from the sun when you're using hydroquinone cream. Common side effects of hydroquinone include dryness, redness or burning, according to Drugs.com. Obtain immediate medical help if you experience severe reactions such as rash, hives, difficulty breathing, tightness in the chest, swelling or blistering. Do not use products such as soap, after shave or lotions that irritate your skin, because they may cause the melasma to worsen, according to the AAD. After the melasma clears up, continue wearing sunscreen to help prevent it from reoccurring.